If you’re an avid DIY enthusiast or simply like to be prepared to tackle basic repair and maintenance jobs around your home, then chances are you own a wide selection of hand tools and power tools. From socket sets and screwdrivers to pliers, drill bits, and jigsaws, these tools were probably accumulated over a number of years and cost a fair amount of money, so it makes sense to protect these items and keep them well organized within a toolbox or tool chest. The best way to accomplish this is to use foam sheets and custom cutouts in the storage unit. Here’s how to do it. Plan out the tool arrangement in each drawer of the toolbox to make sure you have enough room for everything, taking care to leave approximately 1/2” – 3/4” of space around each tool for the foam cushioning. Some people find it helpful to sketch the arrangement on paper first. Cut a sheet of polyethylene foam to the size of the toolbox drawer. The fit should be as exact as possible so the foam doesn’t move around when opening and closing the drawer. Using the marker, trace the outline of each tool you want to store in the drawer according to the plan you came up with in Step 1. Cut out the tool shapes with the electric kitchen knife. The goal here is to aim for a snug fit when the tools are stored, so don’t overdo the cutting. You can always trim more later on if the cutout is too tight. Check the fit of the tools in the cutouts, making tweaks and adjustments where necessary. Repeat steps 2-5 for each drawer in your toolbox. 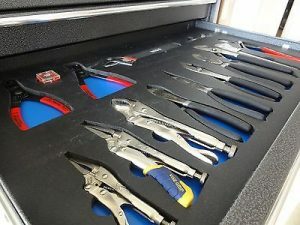 Using foam cutouts is an effective and affordable way to protect and organize your tools. You’ll find yourself spending less time looking for the right wrench or screwdriver and more time actually working on your favorite projects. Order some closed-cell polyethylene foam sheets from FoamByMail.com today so you can get organized as soon as possible.